Celebrate her first birthday with a personal gift! Celebrate with your friends a baby shower? And you want to surprise the good expectant mothers with a baby shower gift? 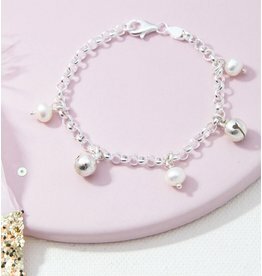 See below our collection of unique jewelry, from bracelets sweet baby to mother and baby bracelets. All meaningful gifts and to put the future baby in the sun, the expectant mothers. Sure mama upgraded some meaningful jewelry. The first verjaardagvan your child is a real milestone. Incredibly quickly developed your child in the past 12 years. She has learned to learn to crawl, stand, sit and tasty babble. The first words "mama" and "dada" may also mention. This time pole is often celebrated with a baby party where family, grandparents and some friends are invited. But what would you now present? By KAYA we make special jewelry for tangible to remember special moments, such as her first birthday. For example, let engrave a pendant with her name on it. Or give a nice parelset for the little girl. Not only splendid for the photo shoot, but also a tangible reminder for later! Hooray! Your baby is one year. She's not a baby anymore, but a toddler. But what is a toddler really? Often people say after baby toddler together. But there is a whole phase daartussin: the toddler time. Your baby makes three leaps, a nice book to dive again here is' oops I grow up. " It is best hard to imagine what will your child before his first birthday. it is wise to buy something that will last a while for children aged 1 year. Personally I'm a fan of wooden toys. Your child will learn namely differentiate into smooth, rough, soft and hard objects. For her party itself is naturally beautiful as they get matching jewelry next to a beautiful dress. Extra fun for the beautiful pictures that will be created. Choose a bracelet, necklace or a personalized ornament. Especially for our 'first year' jewelry we put an extension chain everywhere. This grows another 2 to 3 years with her polsje. In order then to store and later retrieve memories of its first anniversary. Extra nice is that the bracelets now also be personalized with a name charm example, text charm with personal message or letter of the first name of the child. Huge fun during her first photo shoot or anniversary. And, of course, is also thought to the mother; each baby bracelet is a matching bracelet available mama. 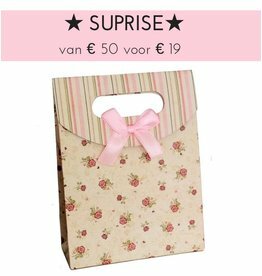 Ideal to surprise a new mother with a special gift. The baby bracelets are very cute to wear and later form a tangible reminder of infancy. 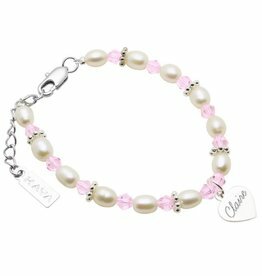 This is a very special bracelet with her name engraved on a heart. Completely personal to your little girl! Made of bright white pearls, pink Swarovski crystals and pink quartz. 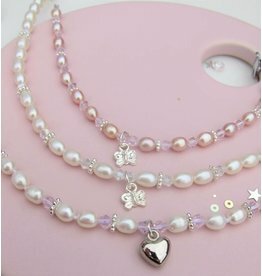 Give a unique gift with this beautiful kids necklace. What they will shine with her real gems, white Swarovski crystal heart and a sphere. You get the kids necklace in a beautiful sieradenbuideltje, as ready to give!